National Express cover 98% of the UK including local stops in England, Wales and Scotland. They run services that can take you to and from Gatwick Airport throughout the day. They are also often running special offers or discounts and are one of the cheapest ways to get around. With cheap tickets on clean, comfortable and prompt coaches and friendly drivers, it’s a wonderfully affordable way to travel. In the future you may even want to consider taking one of their coaches to your next European destination! Using a dedicated coach service from National Express means that you will also save money on driving costs such as fuel and parking. This way you will be dropped of at the terminal door! Your friendly driver will help you with your luggage while you board and make your way to your clean, comfortable and spacious seat. National Express coaches also have on board washrooms and have been designed to make your journey as comfortable and relaxing as possible. Whether you are looking to get between Gatwick airport and Heathrow or further out locations like Manchester, you will find a coach to suit your particular journey requirements at a great price! A dedicated shuttle direct transfer between Gatwick and Heathrow is available at £25 for a one-way journey. A return ticket of this service is offered at a slightly discounted £40 return. There are also a limited number of transfers to Gatwick available at £6.50, plus a £1 booking fee, which are only available when booked online and the numbers are limited. 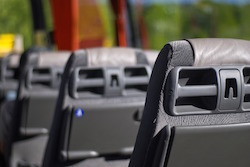 National Express offers the only direct airport connection and links all the four major London airports, Gatwick, Heathrow, Luton and Stansted airports. They operate 100 services a day between Gatwick and Heathrow which takes around 1 hour. There are many local stops which you can book to and from, but some of the main destinations and departure points and the duration of the journeys are shown below. Gatwick – Heathrow 1 hour Direct Service, 100+ trips per day. Gatwick – Cambridge 3 Hours 40 Minutes Via Heathrow & Stansted. Gatwick – London Victoria 1 Hour 30 Minutes Direct service departing every 15 mins throughout the day. Gatwick – Brighton 1 hour Hourly throughout day. Pick up an drop off points at Gatwick airport depends on the terminal you are arriving to or departing from. Please see below for pick up and drop off points at both the North and South terminals. Coach services arrive and depart from the lower level outside the international arrivals area. There is a National Express coach ticketing office inside the terminal at international arrivals. You can connect to the South Terminal easily with the free monorail transit train service which is clearly signposted from around the terminal. Coach Services will arrive and depart from the lower forecourt at stops 16 & 17. There are ticket offices located in the arrivals travel centre and in the upper forecourt area. You can connect to the North Terminal on the free transit train service which is clearly signposted. If you are over 60 years old, you will qualify for an automatic discount on coach travel with National Express. The Senior Coachcard saves you 1/3 on standard fares to hundreds of UK towns, cities and airports for just £10 (plus £1.50 p&p) a year. No restrictions on peak and off peak travel times, including public holidays, bank holidays and weekends. Buy a Senior Coachcard online and save money every time you visit your family and friends.Find out more and apply for a Senior Coachcard. Families can make great savings when travelling by coach to and from Gatwick Airport, and across the UK. National Express have special concession cards for families called Coachcards and they cost just £8 or £16 for a whole year of discounted travel for children (aged 3-15) depending on the number of adults and children travelling. You can choose from their 1plus1 (£8 per year) or 2plus2 (£16 per year) Coachcards. 1plus1 allows one child to travel free when accompanied by a full paying adult, and 2plus2 allows 2 children to travel free when accompanied by 2 full paying adults. Under 3’s always travel for free on National Express coaches. Young Persons aged between 16-26 can apply for discounted coach travel, too! Save up to a third on your travel costs, with cards starting at just £10 for the year. To take advantage of any of the above card, visit the Offers section on the National Express site. Travelling by coach has been proven to be one of the most environmentally friendly forms of public transport. National Express are very proud that they are helping people to cut down on their carbon footprint and want you to join in with cutting down the UK’s carbon emissions, so have created an emissions calculator to enable you to see how big your carbon footprint is and how much you can cut that down by travelling by coach!